Nothing beats the feeling of getting married on a beach. The sun’s golden glow encompasses everything you see and the crystal-clear water enhances the beauty of your biggest day. All of your loved ones are around to witness this once-in-a-lifetime event. To ensure your beach wedding goes smoothly as possible, you’ll need to enlist the aid of trusted suppliers. Among the professionals you’re going to hire is a wedding photographer. The photographer works to capture all of your special moments and create images to last a lifetime. In the age of smart phones and social filters, it is easy to think that a photographer is not a necessity, however you and your guests should enjoy the moment and allow the professionals to capture it. Your wedding photographer will be there at the earliest stages of the preparations and will be one of the last to leave after the party is done. The photographer plays a crucial role in the success of your big day, from the first kiss, to the details that you spent hours picking out, to the last dance, your wedding photographer will be there to document it. Therefore, it is important to choose someone that can exceed all of your expectations. 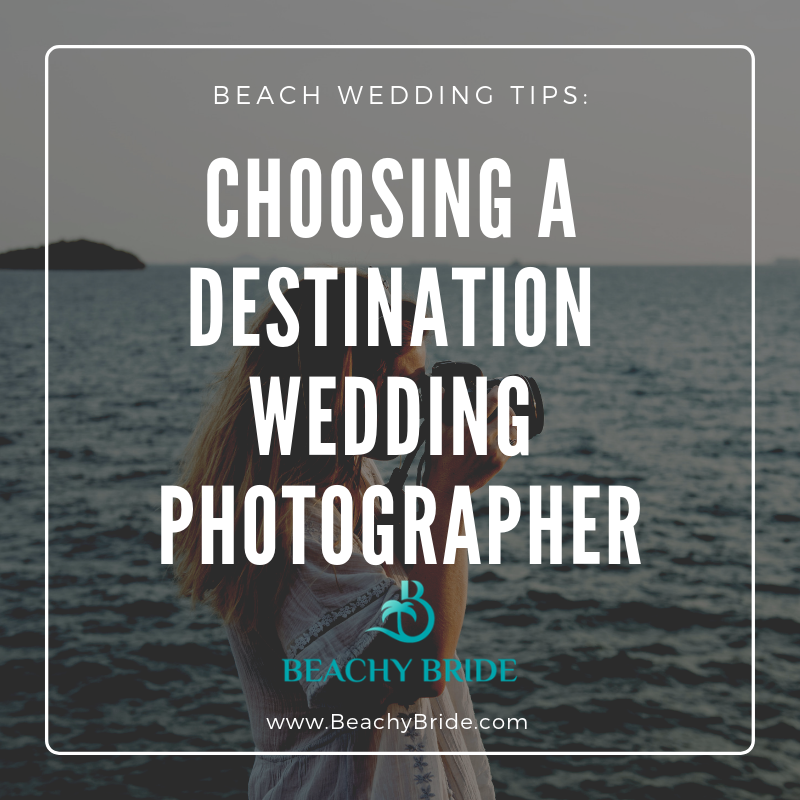 As such, here is a quick list that can help you choose the best photographer for your beach wedding. There are some photographers who are used to shooting traditional weddings. In your case, what you should look for is someone who is familiar with how a beach wedding – the lighting, the wind, the sunsets. A beach wedding presents certain challenges. A good example is how your photographer will deal with the open nature of the beach. It’s going to be bright for the better part of your wedding and the photographer should be able to compensate with his/her shooting experience. If you’re having a hard time finding someone who has experience in shooting beach weddings, be sure to check out our forum and search for destination wedding photographers. Finding a local photographer will surely make your day even more memorable by placing you in the best spots at the location. They know the ins and outs of the location, best angles and lighting to capture the perfect moments of your day. This will give you the assurance that they know exactly how to maximize the beauty of the place while capturing your wedding images. While you may have done your own research about the coolest spots on the beach, nothing beats the experience of a local photographer. He/she has captured tons of images in that location and has experimented on the best spots, the best hour, and the best angle for the photos. However, if you have a photographer in your hometown that you trust, you can always send them down a few days before to scout out the best locations and test the lighting before the big day. Along with choosing an experienced photographer, you should also determine if they can pull off your create your preferred style. There are different styles of photography. Some prefer classic while others are drawn to artistic. No matter how their images look, it’s crucial to have your preference fulfilled. You can start by checking out your target photographer’s website or social media account. Look at how the wedding photographer tackles each stage of a beach wedding, from the preparations to the reception party. Also, don’t just review one professional. Make a list of photographers who fall under your chosen style and check them all. From there, you can trim the list to the top three. In the end, you’re going to choose one that fits your tastes the best. Once you have chosen your beach wedding photographer, it’s time to set a meeting with this professional. Before the aforementioned meeting, you can ask this person to bring his/her albums and sample photos. These things will give you an exact idea of the output of your photographer. At the same time, ask him/her on how they’re going to handle the job if you decide to book their services. The answers they will provide will give you an insight on how they’re going to perform during the actual event. Also, don’t be afraid to speak your mind on every aspect of your big day. This is your chance to learn everything you need to make a wise decision on the photographer you’re going to hire. Now that you have met this professional, it’s time to get down to the nitty gritty. You want to know the price options, what is included, how many photographers and assistants, are the images digital or film, How many hours are included and will that be enough to cover all the important events throughout the day. In addition, you’ll also have to account for their food and lodging. Don’t worry because these expenses are justified so your photographers can perform well during the wedding itself. Open communication with your wedding photographer is vital. You only have one shot (pun intended, lol) and your day will feel like a moment. Prepare a list for your photographer with your must have photos so that you are not left with any regrets. Be sure to get shots of family and friends who may not be in the bridal party. Generational photos are always significant. Don’t forget about grandparents and relatives who you may not see often. After the day goes by, you will be glad to have the photos of the ones you love. Don’t forget the “Must Have Not” list. You know your friends and family better than the photographer. Although a photo with all the uncles may seem like a good idea, if Uncle George is one step away from throwing Uncle Mike down the stairs, it is best to avoid such close proximity. Family dynamics can come into play at weddings, so it is best to let the photographer know if there are any shots that you rather not be taken. Now that you have met your photographer and found out every little detail, you can make a sound decision on whether they are the right fit for you. It’s important to feel comfortable around these professionals but you also need to think about your budget. It’s never alright to go overboard when it comes to your finances. It might be hard but there will always be a balance in these things. Once you have managed to find that balance, you can breathe a sigh of relief now. You’ve found a photographer to memorialize the beach wedding you have been dreaming about. In sum, it is so important to find the right wedding photographer for your beach wedding, because after all the fun and sun, it is the photos and memories that you will you have for a lifetime.